The Blue Angels are insanely talented—and, if this video is anything to go by, also more than a little nuts. 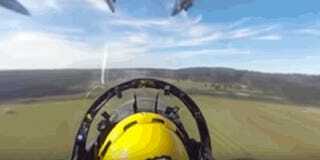 The 360-degree view from a cockpit of one of their F18s is amazing, exhilarating and absolutely terrifying all at once. The video is shot from Blue Angel 2, which assumes perhaps the most terrifying position in the fleet—right between all the other jets. Thanks to some smart video capture technology carried out by the guys at USA Today, you can pan around the video as it plays and see just how close the airplanes get. BBC Future points out that, at times, they’re as close as 18 inches as they rip through the sky at hundreds of miles per hour. Gulp.